It recently came to light that many of you have been finding warning messages in phpMyAdmin after upgrading to PHP 7.2. Especially, those of you who followed my video last year on how to install Magento 2.3. Well, in this tutorial I’ll be covering how to update your version of phpMyAdmin to the latest version that is fully compatible with PHP 7.2 – Therefore allowing you to say goodbye to those annoying warnings. For whatever reason when you install phpMyAdmin using the traditional “apt-get” command, it only installs an older version. And this version happens to have some incompatibilities with the latest version of PHP 7.2. This was never an issue before, because it’s only very recently that Magento 2 has supported this version of PHP. The default version of phpMyAdmin that get installed on my server is version 4.5. Indicated on the homepage of the application. When running this version of phpMyAdmin with PHP 7.2 you will likely see warning messages like this. Because we can’t currently update phpMyAdmin via my usual method of “apt-get” , it means I’ll have to do it manually. After doing a little research into this method, I ended up streamlining the installation process down to just 11 very simple steps. Before starting the first step, I should point out that I’m already logged into my web server as a superuser . Just to recap, a superuser is a user that is capable of running commands beginning with “sudo” . It’s also worth noting, that I’m literally copying and pasting these commands directly from this article. Remember to always backup your server before following any instructions. At this point, I’m not in the nano text editor viewing the contents of the config file. Luckily, there is already a comment next to the line I need to edit with some instructions. So, all I need to do is type a random set of numbers and letters in the space provided. I’m literally going hit random keys until I have around 40-60 characters. Now that I’m going entering in a random set of numbers and characters to generate my security key, I just need to save and exit. To do that I just need to press “Ctrl+X” to exit, then press “Y” and Enter to save. This will take me back to the original screen that I was on before. If I’ve followed all of steps correctly, then that should mean when I log into phpMyAdmin it will show the latest version of phpMyAdmin. 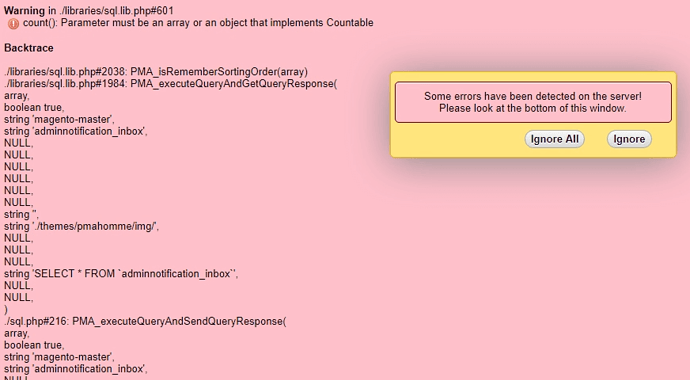 This is indicated here… And when I go into my database and click on any tables, the warning messages have now disappeared.